Spread crushed cookies in bottom of a 9-inch pie pan. Beat together cream cheese and sweetened condensed milk until smooth, add frozen whipped topping. Add in lemon or lime juice. Spread cream cheese mixture evenly over crushed chocolate sandwich cookies. Chill for several hours or overnight. Top with Lucky Leaf pie filling of choice. Can be made in individual ramekins for single serving. This was so very easy to make, I tried to surprise my husband but the great smells that filled the house gave my surprise away… My husband comes into the kitchen asking what is that great smell, it smells like the holidays in here. Even though it was not bakes you could smell the cherries and the sweet cheesecake. I said I had a surprise for him, and asked him to check back in a little while for his treat. In no time I had a wonderful ready to eat cheesecake. After I presented them with this cheesecake they were amazed that this only took a short time, and looked so delicious. Of course my husband loved the cherry topping. So if you are looking for a great Valentine’s day treat for that special someone, or a great treat for your child’s classroom or your coworkers. Why not pick up a can or two of Lucky Leaf they are a must in the pantry. Check out all of the great recipes on the Lucky Leaf site and make something everyone will love. Be sure to check out all of the new recipes, I would love to hear about your favorite Lucky Leaf recipe as well. 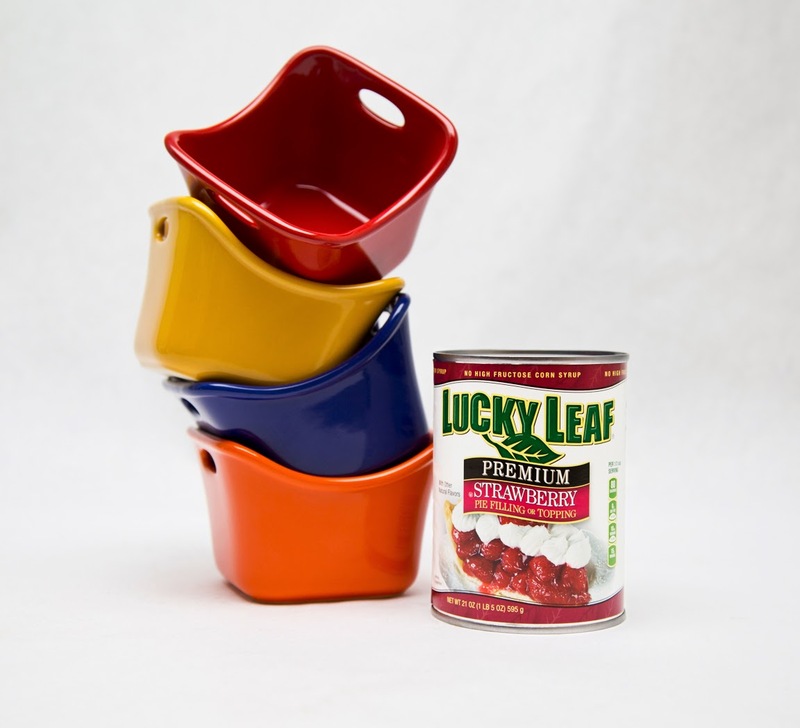 The generous folks at Lucky Leaf are giving one of Susan’s Disney Family readers a chance to win a Lucky Leaf prize pack that includes Lucky Leaf pie filling, three recipes and a Rachael Ray Bubble & Brown Square Singles Stoneware set. Would you like to win? 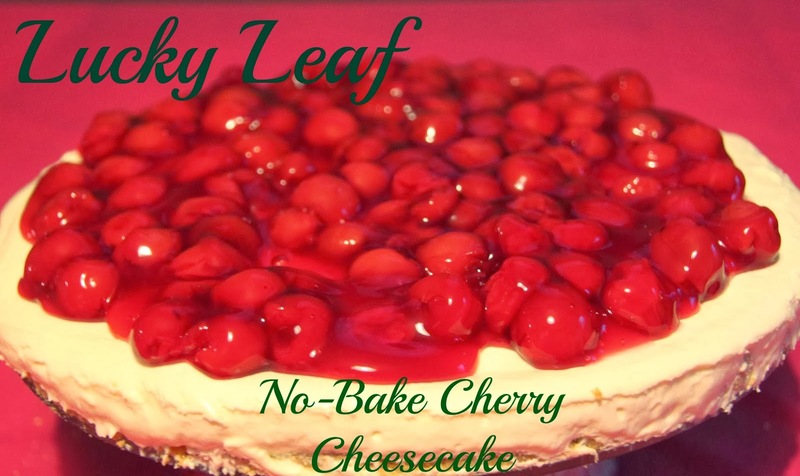 Please visit the Lucky Leaf site, take a look at the recipes on the site. Please let me know another recipe that you would love to make. There are also other ways to enter. Please enter below. Disclosure: The reviews and or opinions on this blog are my own opinions . I received filling to review. No monitory compensation was received. I was not required to write a positive review. Your experience may differ. The opinions I have expressed are my own I am disclosing this in accordance with the Federal Trade Commissions 16 CFR Part 255: Guides Concerning the Use of Endorsement and Testimonials in Advertising . The recipe for Cherry Chocolate-Brownie Cheesecake looks good. The stuffed crust blueberry pie from Lucky Leaf looks amazing. I would really like to try the recipe for the Sugar Dusted Apple Bundt Cake. I would love to make the Cherry Bliss Brownies. I like the No-Bake Cherry Cheesecake because I don't like the baked cheesecakes because their so hard. I love the creaminess of this one. Cherry Bliss Brownies sound fabulous. Cherry pretzel squares or the cherry cheesecake. Stuffed Crust Blueberry Pie looks delicious! stuffed crust blueberry pie is going in my recipe box! The Mini Cherry Pecan Pies are great, thanks. The Sweet Cherry Gianduia Parfait looks delicious...and beautiful. Strawberry White Chocolate Triffle sounds amazing! I would like to try Lucky Leaf's Blueberry Cornbread Cobbler recipe. I'd really like to try the Apple Cheesecake Bars with Sea Salt Caramel Sauce. The Cherry Chocolate-Brownie Cheesecake looks yummy. The apple spice baby cakes!! The Cherry Bliss Brownie recipe from Lucky Leaf sounds really delicious. The Cherry Pineapple Cabana Cake, which is a dump cake, sounds tropical and delicious. the cheesecake bars or chocolate heaven pie! the caramel apple gingerbread sounds good. This is a simple recipe and using Graham Crackers as a substitute for the Chocolate Sandwich Cookie Crust gives it a different taste. I think both would be yummy to eat. Thanks for the ideas. Apple Cinnamon Buns look delicious. I like the Cherry Coconut Squares recipe. I would like to make the Cherry Chocolate Chip bars. The stuffed crust blueberry pie looks SO yummy! I love the stuffed crust blueberry pie. I would love to try the Apple Butter Pumpkin Pie. I would like to try the Apple Butter Pumpkin Pie. The Lemony Blueberry Layered Pie recipe looks amazing. Cherry Pineapple Cabana Cake (Dump Cake) sounds so good! I would love to try the Apple Sauce Chocolate Chip Bars. Looks yummy! Apple cheescake bars sound yummy! The Cherry Chocolate-Brownie Cheesecake looks so good! The lemony blueberry pie sounds amazing, as it combines my two favorite things! My favorite recipe is the Apple Custard Pie recipe. I like the Cherry Pretzel Squares Recipe. I love the Apple Blue Cheese Toasts! The Blueberry Lemon Trifle sounds amazing. The Angel Food Patriotic Delight Trifle looks really good. I would like to try the Apple Sweet Potato Bake. I like the Apple Cheese Danish recipe. Stuffed Crust Blueberry Pie sounds yummy. I would like to try the "Apple Cheesecake Bars with Sea Salt Caramel Sauce". I love their apple pie. The mini cherry pecan pies are the best! The Cherry Bliss Brownies ..Yummy! I love their Cherry Bliss Brownies recipe! I like the Lemony Blueberry Layered Pie recipe. I think I would like to try the Cherry Chocolate Macaroon Pie but really....I want them ALL!!!!! I would love to try the Sweet ‘n Savory Chicken Sausage & Apple Pizza. It looks delicious. I would like to try the Cherry Cheesecake! I would love to try the cherry chocolate brownie cheesecake. Cherry Chocolate-Brownie Cheesecake looks amazing. I'd like to try the Cherry Cheesecake! I'm planning on try the Sugar Dusted Apple Bundt Cake recipe. I would like to try cherry bliss brownies, Thank you! 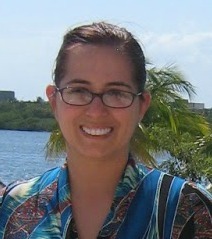 i'd love to make the key lime pie recipe, my dad and myself love key lime pie! I think my family would love the Sugar Dusted Apple Bundt Cake recipe from Lucky Leaf. Mini Cherry Pecan pies look delicious! I would like to try the Layers of Lemony Love recipe. i would like to try the Apple Cheesecake Bars with Sea Salt Caramel Sauce recipe. i am tony l smoaks on rafflecopter. I'd like to try the Cherry Chocolate-Brownie Cheesecake recipe! I would love to try the Apple Cheesecake Bars with Sea Salt Caramel Sauce recipe from Lucky Leaf. the Lemony Blueberry Layered Pie looks really good. No Bake Cherry Cheese Cake my very favorite! I would love to try the Cherry Pretzel Square recipe. I've made the No-Bake Cherry Cheesecake and it's easy and delicious. Thanks for having this contest. I'd love to try the Cherry Chocolate-Brownie Cheesecake. Oh, I need to try the Cherry Pretzel Squares. Now that looks good! Thanks for the giveaway…we like their Cherry Bliss Brownies recipe. Love the Caramel Apple pie recipe. Yum! Wow, the cherries on top makes the cake look extra decadent! Yum! ive tried em...they are pretty good..
i really like the whole no-bake idea. because it's awesome. and YUM. I make thing a bit like this with those nice canned cherries with Greek yoogurt and an almond meal crust. This sounds like it is really easy to make. It looks yummy too. I'm definitely going to try this for my family. This cheesecake is so good-looking it must be delicious, I am due to make this this coming weekend. I thank you for the share. I don't remember the last time I had Cherry Cheesecake. I love this recipe. This is stunning and so easy I want to make it for some upcoming events - it is perfect! This looks like the perfect item to bring to a 4Th of July gathering. I'm surprised that the cheesecake fragrance wafted for others to lure them to the kitchen without baking - this looks soo good I can have cheesecake in the middle of summer - yea! This recipe looks awesome! I love that it is no bake and fairly easy to put together! I'm going to pin this to make.